This past December, four Sherpa alpinists made the first ascent of the main summit of Nepal's Langdung peak (6357m)—Dawa Yangzum Sherpa, her older brother Dawa Gyalje Sherpa, Pasang Kidar Sherpa and Nima Tenji Sherpa. 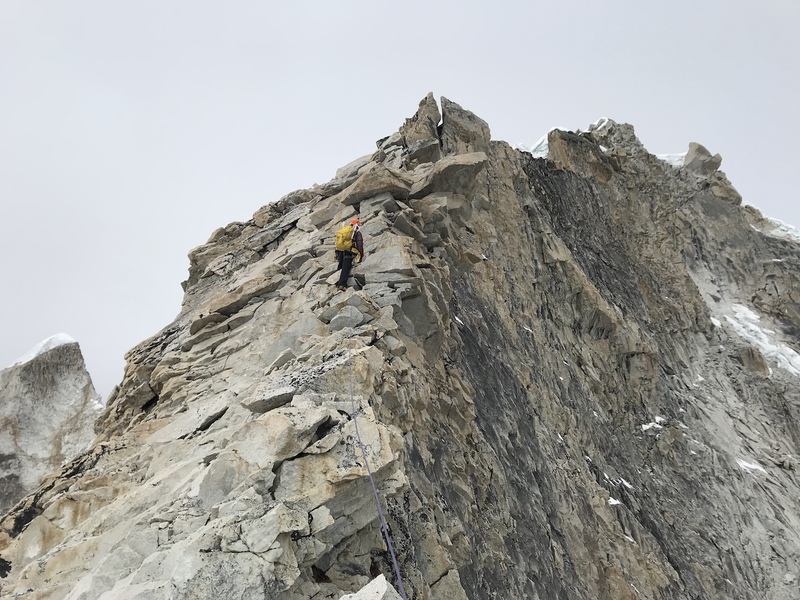 They climbed the southeast face to the southeast ridge in alpine style, spending five days on the mountain and summiting in a 16-hour round trip from their high camp on December 20. They named their route Namaste (PD, 650m). "It was a mixed climb, including climbing on snow, rocks and ice," Dawa Yangzum recalled in an email. "We climbed along the ridge, which was actually safer except for the wind. 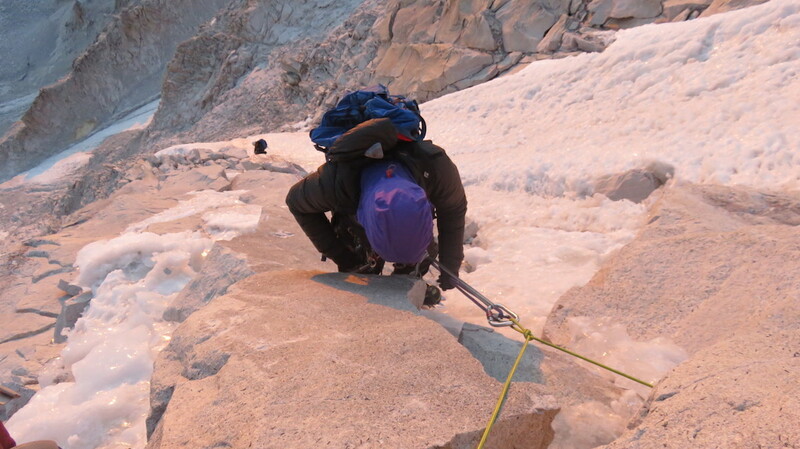 However, we descended via the south face, which had no snow but a lot of loose rocks. 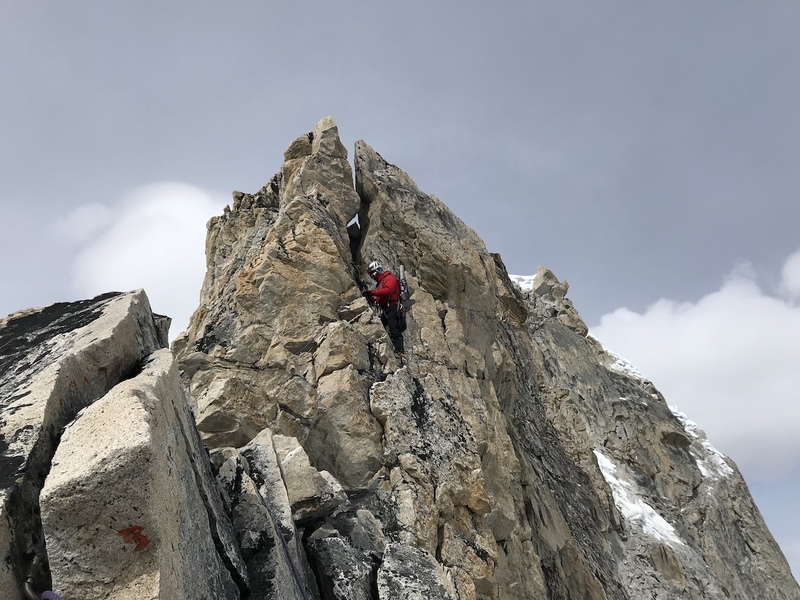 So there was frequent rockfall, and even anchors were not as secure.... We went to the main summit, and the other two are still unclimbed [the 6301-meter west peak and the 6350-meter central peak]." 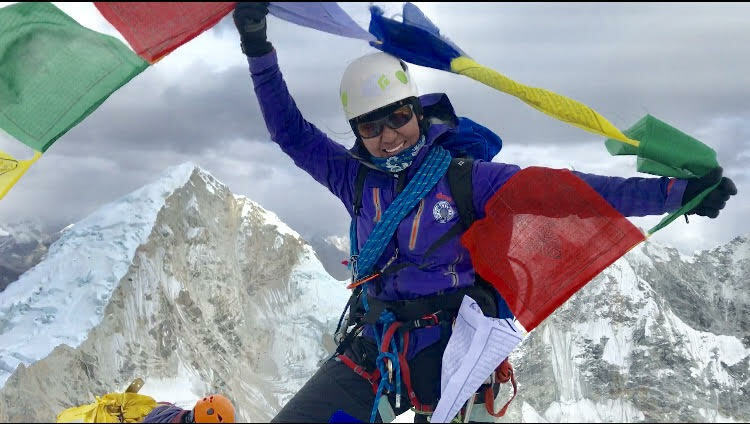 Dawa Yangzum, 27, recently became the first Nepali woman to get certified as an IFMGA guide. A video about Dawa Yangzum on OutsideOnline.com reports that there are nearly 7,000 IFMGA guides and "just over 100 of them—1.5%—are women." 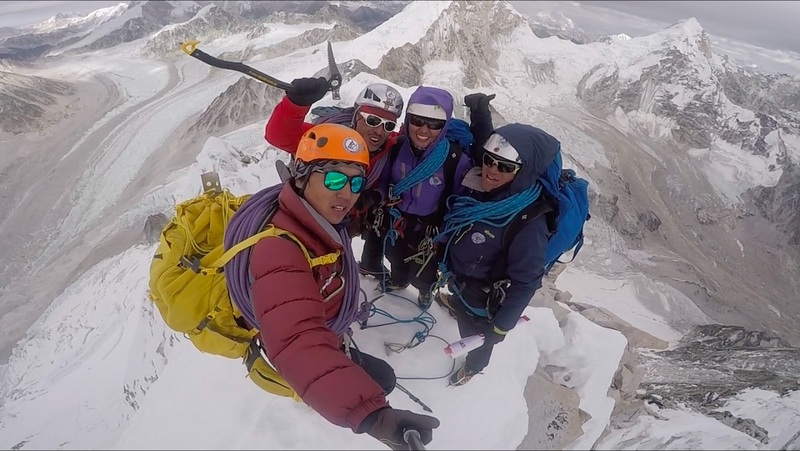 "My IFMGA certification is complete, however, there is a caveat," Dawa Yangzum told Alpinist. "Exams in skiing [are] not required in Nepal. Other than that, I have completed everything, and received the full certification...."
Dawa Yangzum's brother, Dawa Gyalje, 36, is also an IFMGA guide. "Initially, it was just going to be me and my brother," Dawa Yangzum said about their Langdung ascent, which was partly supported by a Grit&Rock grant for women to make first ascents. "We obviously trust each other, and we wanted to do a first ascent together. Once others heard about our plan, quite a number of Sherpas approached us to join the climb. In the end, we decided to let Nima Tenji and Pasang Kidar join our team. 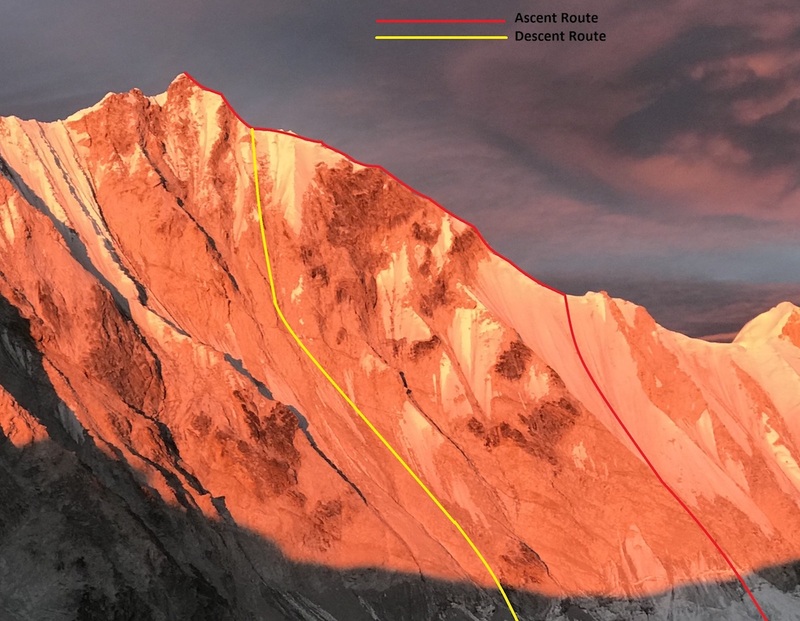 The number had to be even, since two climbers would be roped together [in separate teams] during the summit push, which took us 16 hours. Things have changed now, and there is a growing trend among Sherpa climbers to go to the mountains even when they are not hired, especially to complete first ascents." According to a December 26 Himalayan Times article, Langdung was opened to climbing in 2014 and had been attempted by a couple other teams before the Sherpa team's ascent. Hari Mix and Furtemba Sherpa completed a route on the south face (5.3 AI3 75 degrees, 600m) reaching a high point of 6000 meters in 2016, but turned around because of poor snow conditions on the southeast ridge. Dawa Yangzum was included in a 2015 Alpinist 52 story by Charlotte Austin, titled "Freedom in the Hills," that features some of the many varied experiences of strong female climbers in today's mountaineering world. The following Q&A contains a few of Dawa Yangzum's answers from an interview that Austin conducted as part of her research on modern women's alpinism and gender issues for the article. Did you experience an increased sense of freedom when you began climbing? Did any of that sense of freedom come from a feeling of escaping stereotypical gender roles? When you are high up in the mountains, there is only one goal, and that is to reach the summit. So there is no doubt that the "summit fever" dominates your thoughts. However, you also achieve a sense of elation, a sense of freedom and sense of escape from the regular day-to-day concerns or stresses of life. Regarding gender roles, as a Sherpa female guide on Everest and Cho Oyu, I definitely felt the erosion of stereotypical roles of female climbers, especially since I had to lug the same amount of loads as male Sherpa guides, and more than male Western climbers. Do you think there are cultural issues that women face that hold them back in any way in today's mountaineering world? If so, what? If not, why not? Let me speak as a female Sherpa climber who grew up in Nepal. Women enjoy a lot more freedom within the Sherpa community compared to other ethnic groups in Nepal. However, we certainly don't enjoy the same level of freedom as men do. As married women, we get a lot of pressure from our own family and our spouses' family to stay away from higher mountains such as K2 and Everest. On top, Nepal doesn't have the larger outfitters that could provide us with sponsorship to pursue our interests. As an Asian female climber, we have found it is almost impossible to get sponsorship from the larger western outfitters, pushing us to support ourselves and our families by doing jobs other than climbing. Therefore, it is not surprising that there are so few female mountain climbers in Asian countries. Why do you think there are fewer female alpinists than male alpinists today? What kinds of changes—in the climbing world or in larger society—do you think might increase the numbers of women who climb in the mountains? In Nepal and other Asian countries, there is definitely a cultural shift that is slowly encouraging more females to enter the climbing world. However, we do need to see more outfitters actively promoting more female athletes who will serve as role models to future generation of female climbers. Is being a "female climber" part of your sense of identity and experience in the mountaineering world or do you prefer to be thought of (or to think of yourself) as a "climber"? Has the rise of social media influenced the way we see female alpinists? If so, how? I personally feel that social media has helped to level the playing field for the female alpinists. This has allowed us to better connect to each other, and also get support from other women's groups that may not be necessarily involved with climbing. OutsideOnline.com posted an in-depth profile on Dawa Yangzum on April 3 that can be found here.